All domestic Bat species are at risk in their habitats and are acutely threatened with extinction! In terms of numbers, bats are the second largest group within the mammals, but they are the only ones that can actively fly. Bats are not flying mice (German word for bat = “flapping mouse”). Their scientific name is Chiroptera, i.e. “hand” + “wing”. Bats live worldwide, on almost all continents of the Earth; apart from the Antarctic. There are 900 different species. 24 Bat species have been verified in the whole of Germany and 53 in the whole of Europe. 24 Bat species have been verified in the whole of Germany and 53 in the whole of Europe. Bats not only occupy the walls of houses, but also quiet, spacious roofs. 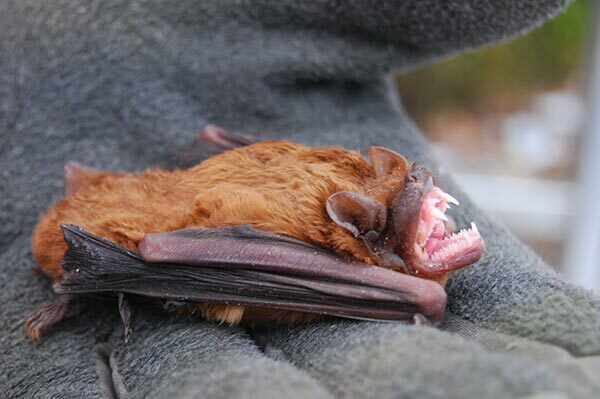 A typical “house bat” is, e.g. the Mouse-Eared Bat, a “tree bat” would be the Bechstein’s Bat and a representative of the “forest bat” is the Common Noctule Bat. Bats love warmth. The roosts are therefore mostly south-facing. SCHWEGLER Bat Boxes are coloured black, as this colour attracts heat. 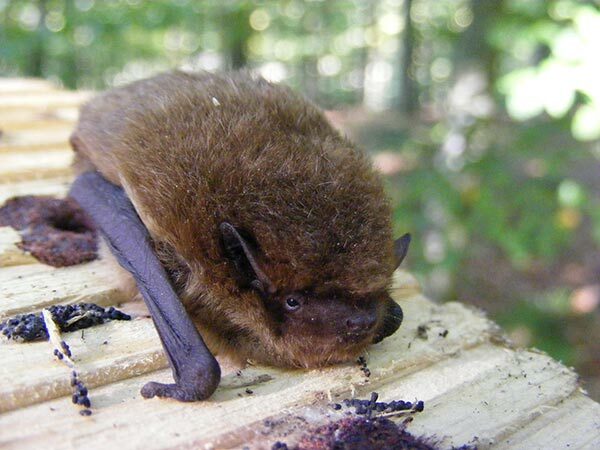 Light, sunny places on forestry paths, windfall or clear felling areas, quiet avenues, large gardens, cemeteries, and many other places are suitable habitats for hanging up Bat Boxes. Ensure a clear, unobstructed approach/entry path. A certain proximity to lakes and streams always proves to be very positive. As bats tend to change their roost spontaneously, Bat Boxes should always be hung up in groups of 3 to 5 boxes at small distances apart. The best height to hang them is between 3 and 6 m. See “Model key for hanging up Bat Boxes” below. 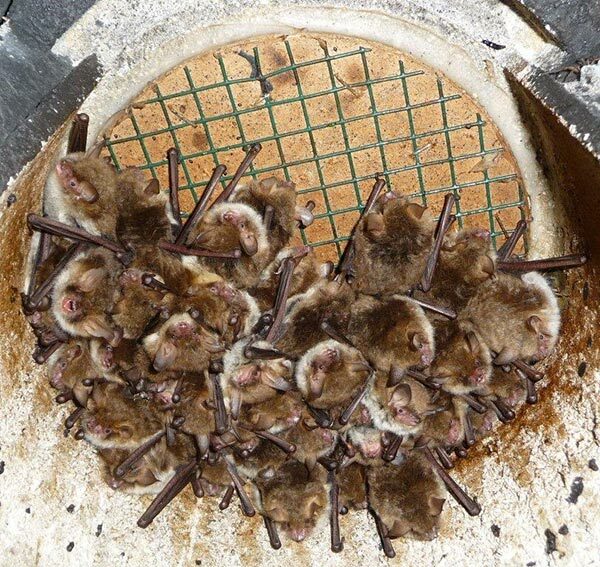 Renovation work, structural alterations on Bat roosts in houses or even the cleaning of Bat Boxes should not be carried out before the beginning of September. Only then do most Bats leave their summer roosts. Bats react far more sensitively than Birds. Here too, the same applies as to Bird Nest Boxes: Simply remove the excrement, do not spray. The cleaning is best carried out using our SCHWEGLER Cleaning Tool. Bats play an extremely important role in the ecological balance. 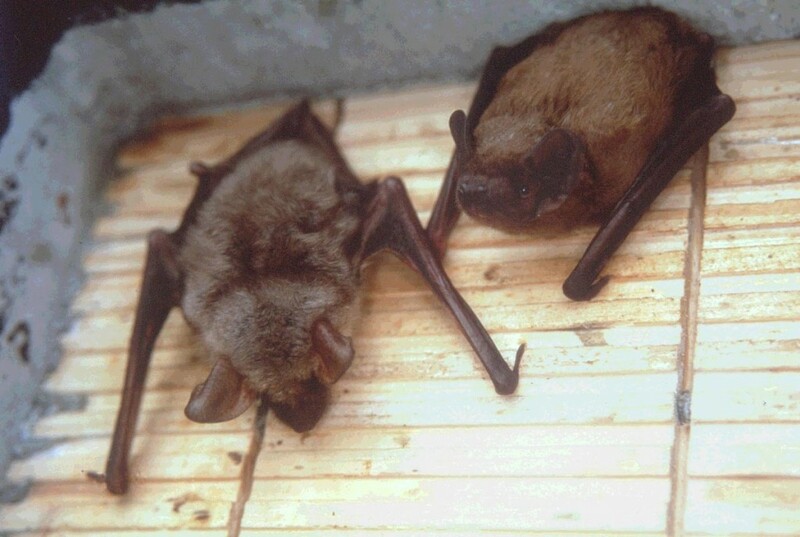 Apart from birds and spiders, bats are among the most important insect exterminators. Bats leave their roosts in the dusk. Birds and Bats, among others, thus share their tasks very skilfully. Birds hunt “harmful insects” during the day and Bats do so at night! Guide to Bat Box Types and quantity needed. Pest control free of charge! Pest control free of charge! Bats play an important role in biological “pest control”. The food requirements of bats are very large. Scientific investigations have shown that larger bats kill up to one kilo of insects during the summer. This is equivalent to a quantity of half a million insects. According to studies by the Soviet zoologist Korskof, it is said that, for example, a single waterfowl from 15 May to 15 October destroyed about 60,000 mosquitoes. The recommended distribution is intended only as a rough guide, for example when initiating Bat conservation projects and in the absence of other findings or recommendations. Local or climatic variations as well as the geographical concentration of various species will generally tend to have a significant influence on the key. It should therefore always be adapted individually in accordance with the conditions at a particular location. After a few seasons you will begin to notice that your Bat population will reveal a preference for particular models of Bat Boxes. For the greatest success, both Bat Boxes and Birds boxes should be put up and can be in close proximity. 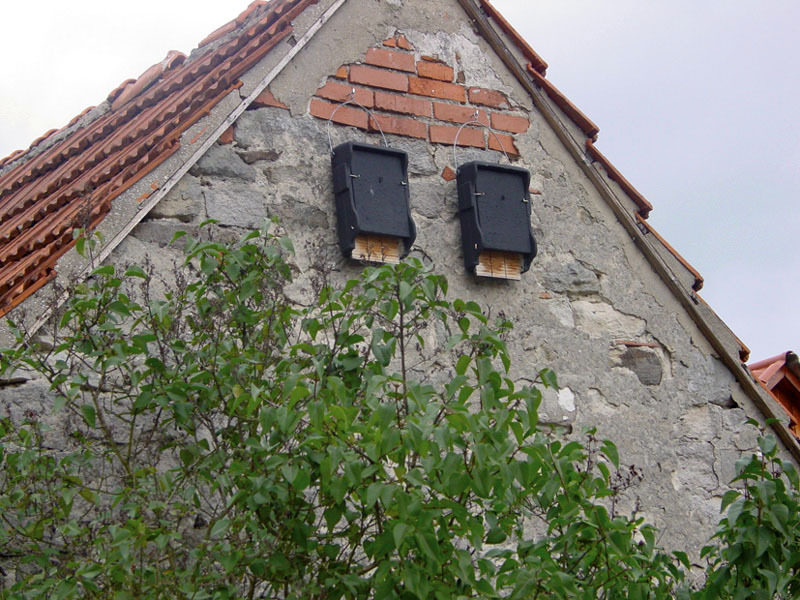 The availability of Bird Boxes will discourage Birds from occupying Bat Boxes. 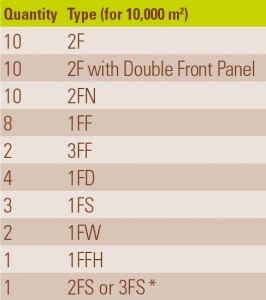 Quantities given for approx. 15% Bat Boxes in conjunction with Bird Nest Boxes over an area of approx. 10 ha. Bats are already well established occupants in our settlements and buildings. Generally unobtrusive, they can often be found in roof spaces, large industrial buildings, under motorway bridges, behind wall cladding and also in basements. It is always important to ensure unobstructed access to the quarters from outside. The­ Bats that typically inhabit buildings include the Common Pipistrelle, Serotine Bat, Natterer’s Bat and Barbastelle. For more than 30 years SCHWEGLER has been developing systems for installation in or on buildings in order to either preserve existing roosts or, in the case of new or replacement buildings, to offer new accommodation for Bats. Numerous ingenious and visually attractive solutions have been found. In addition to meeting the specific needs of the animals considerable attention is also given to ensuring that the design complies with building engineering requirements. This is where the outstanding properties of wood-concrete provide by far the best solution. This has ensured many decades of success without any follow-up costs, making this material much more acceptable to developers, planners and tradesmen, as well as ensuring the long term effectiveness of nature conservation measures.